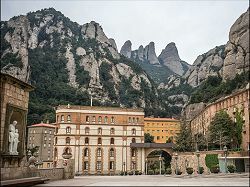 The Montserrat Natural Park lies approximately 90Km inland from Barcelona and the Costa Dorada coustline, covering approximately 40sq Km, an imense dramatic outcrop of eroded limestone (the word Montserrat meaning serated mountain). 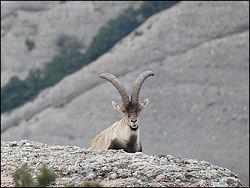 Rising to height of over 1200m, the location offers views to the Mediterranean and the Pyrenees on a clear day. 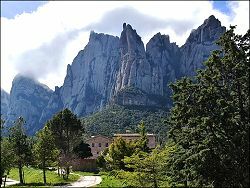 The mountain is also home to the Sant Mar�a Monastery, and important religious and tourist attraction, dating back to the 11th century (though there has been much rebuilding since then). 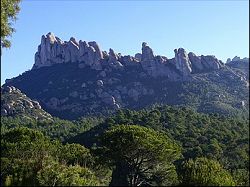 While the limestone massif itself has very little vegetation, the lower areas of the park have forests of pine, holm oak, maple, whitebeam and hazel, where there are likely to be wild cats and wild boar. 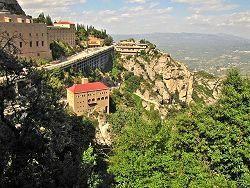 The park and monestry can be accessed from Barcelona by train to Monistrol de Montserrat station, from where there is a modern rack railway taking passengers up to the monestry. 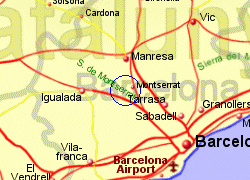 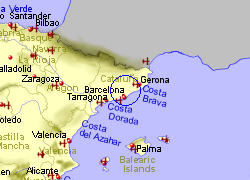 From the monestry, there are two funiculars to the important religious locatiosn of Sant Joan and Santa Cova. 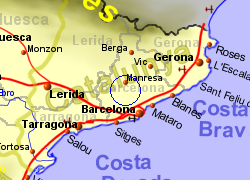 Map of the Montserrat Natural Park area.